The maple trees native to Texas do not include such familiar species as the sugar maple or the silver maple, but several maples do grow within the state. Identification of the leaves of the Texas maples, along with some ornamental types, can be challenging, as a few of these trees have very similar foliage. Others though have quite distinct leaves that are easily recognizable once you become familiar with their features. The Texas maple leaves vary in size, with the longest leaves belonging to the boxelder, a tree with compound leaves that can reach a foot in length. Species such as the red maple and the bigtooth maple possess leaves in the 2 to 5-inch long range, while the leaves of the southern sugar maple and the Florida maple are only from 1 1/2 to 3 inches in length. Of all the maple types native to Texas, only the boxelder lacks single-bladed leaves with multiple lobes. The boxelder has a compound leaf, with a central axis from which three to seven small leaflets emerge. The leaflets that grow from this long stem have short stalks that attach them to the central axis. The leaflets are as long as 2 inches, as wide as 3 inches and possess a series of irregular teeth along their edges. The usual number of leaflets growing on the axis is five, but the Texas Forest Trees web site notes that sometimes there may be seven and on other occasions, as few as three leaflets. While the form of boxelder makes it an easy maple leaf to identify, this is not the case with the rest of the native Texas maples. These maples have a number of lobes and there is not a great difference in sizes between the leaves. However, by concentrating on the sinuses, or the spaces between the lobes on the leaf, you can get a better understanding of the species. The sinuses of the bigtooth maple have an obvious rounded appearance but do not make great inroads toward the center of the leaf. Those of the Florida maple go much deeper into the leaf, producing a much different shape than that of bigtooth maple. Red maple has angled sinuses; silver maple, a common Texas ornamental, has the deepest sinuses of any American maple in the state. The maple leaves of Texas all change color in the fall. What color they turn to can help you identify them. Some have a wide pallet of hues that they can become, such as the red maple and the southern sugar maple. These trees have leaves that go to orange, yellow and red. The bigtooth maple has red and yellow fall colors. Silver maple turns brown or yellow, while boxelder has yellow autumn colors. Like the silver maple, the Japanese maple is not native to Texas and is an ornamental tree. However, unlike the silver maple, the foliage on a Japanese maple bears no resemblance at all to that of other Texas maples. The leaflets on this tree radiate from a central point at the end of a long stem, with from five to seven elongated and narrow leaflets on each compound leaf. 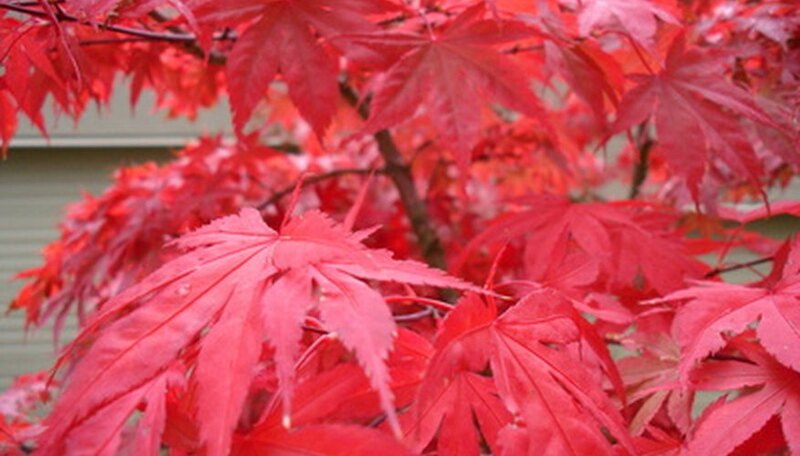 The leaflets can be green, but several hybrids of Japanese maple produce a deep red leaf.